You are here: Home > Archives > Recipes > Korean Recipes > Kimchi > Bean sprout Kimchee, Haven’t you heard of it yet? Bean sprout Kimchee, Haven’t you heard of it yet? Okay, I assume everyone who enjoys Korean food should have tried Kimchee, right? It was either cabbage or radish Kimchee, correct? Maybe some of you(the lucky ones) might have tried cucumber version? Well, have you ever heard of Bean sprout Kimchee? Perhaps you haven’t!… I am not talking about the bean sprout side dish, the Banchan. 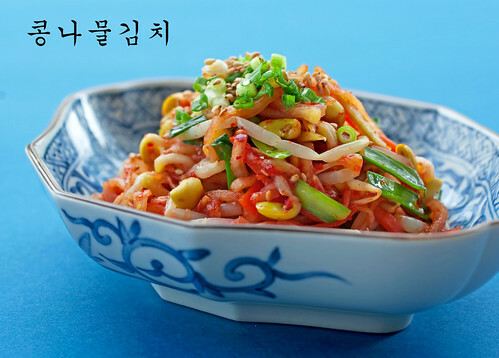 Bean sprout Kimchee is common dish in southwest region(Chul-la Do) of South Korea and also up northern part(Ham-Gyoung Do) of North Korea. 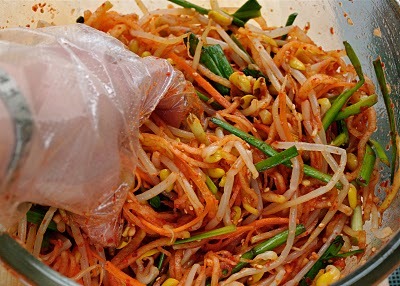 Northern Koreans add mustard and vinegar to the bean sprouts along with fish sauce to make their Kimchee more tangy, and Southwestern Koreans use fish sauce only. Today I will show you how easy it is to make bean sprout Kimchee…far easier than cabbage Kimchee, and you will love the taste. You will like the crunchy texture and the flavors from either fresh or fermented. After all Kimchee is fermented pickled vegetable without using vinegar. This bean sprout Kimchee can last in your fridge for eternity but honestly, it won’t last that long. Why? because you will eat them up within a week! So, do you call yourself a Korean food lover? Then you should try this recipe at least once in your lifetime. Here are what you will need. First, slice the radish thinly (peel first of course). Thinner than 1/8″ if you can. Can you handle that? Good! 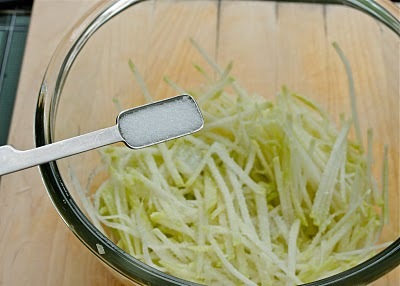 After the slicing, cut them into thin strips. I strongly suggest to use Korean radishes. They hold their crunchy texture in the Kimchee very well. I found daikon radish gets mushy easily. Place the radish in a mixing bowl, add salt and sugar. Set aside for 30 minutes to get pre-seasoned. This will help the radish to extract its moisture and prevent your Kimchee from becoming too watery later. Your radish will look like this after 30minutes. Looks submissive but still crunchy! I would squeeze them out gently with my hands to get rid of extra moisture. Meanwhile place cleaned bean sprouts in a pot with 1/4C water over medium heat. Cook until steam comes out from the pot, turn the heat to low. Continue to cook for 3-4 minutes. Do not open the lid during cooking! Let them cool and set aside. 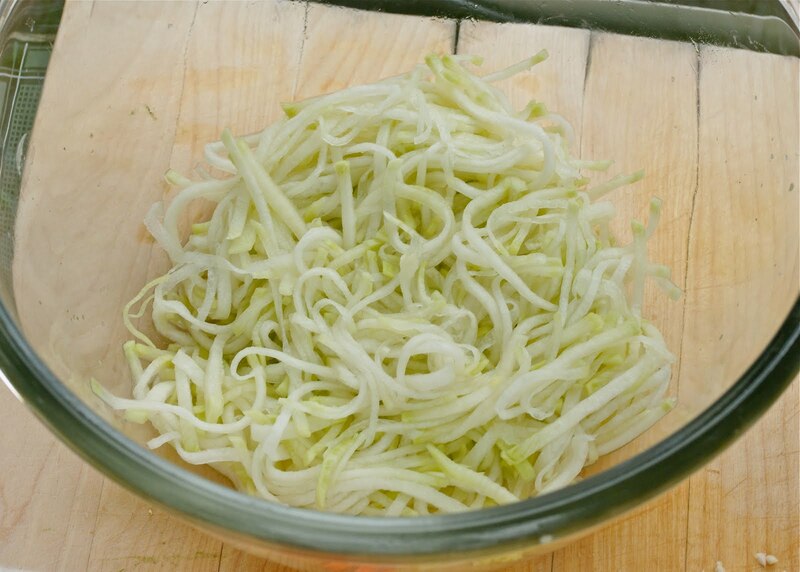 For detailed instruction on how to cook bean sprouts properly, click here. 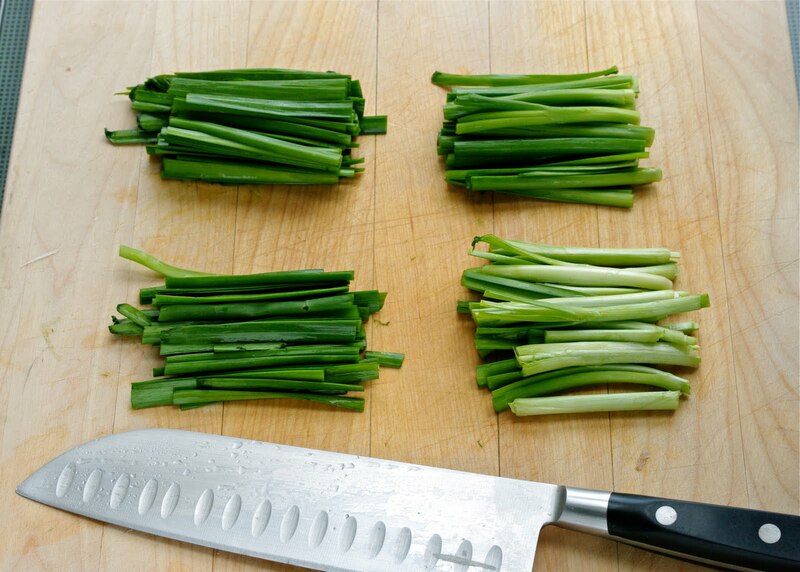 Cut chives into 2″ long slices. 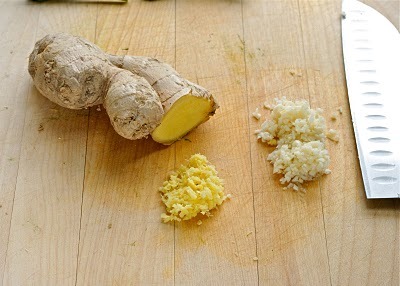 Finely mince garlic and ginger. I had a small piece of carrot running around in my house so I added to the dish. But actually, I kinda like the carrot in the dish. Place the radish back in the bowl and add chili flakes, fish sauce, garlic, ginger. Mix well in Korean way. Use your hands! 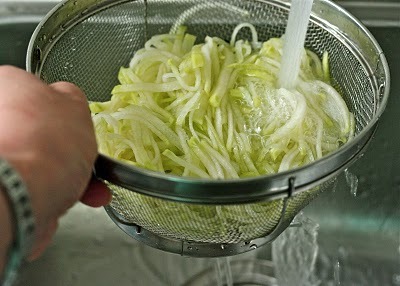 ….gently squeeze them as you are mixing around. 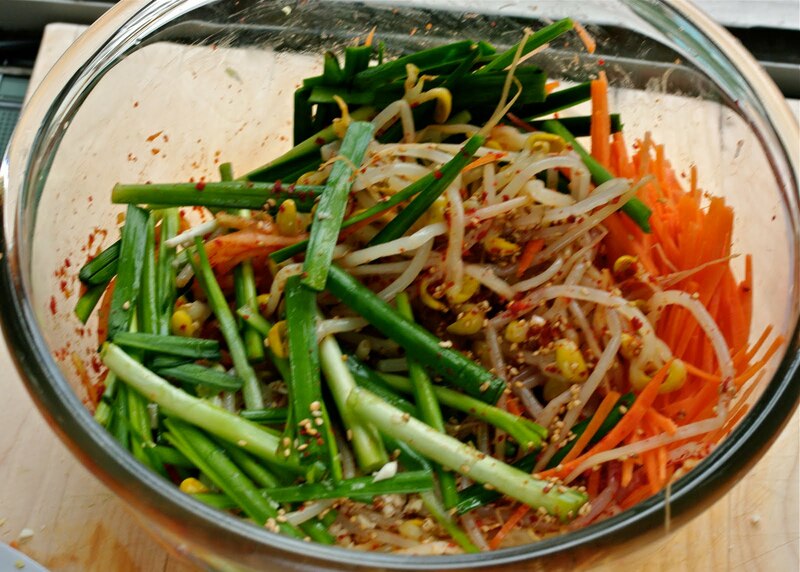 Throw bean sprouts, chives and carrots in the bowl. Add more chili flake, plum extract(or sugar), and sesame seeds. Massaging method again to mix. that’s what my mother used to say when I was learning how to mix vegetables with hands. Lastly, drizzle sesame oil and toss well. You can eat immediately to enjoy fresh flavor. Or keep in the room temperature for a half to one day before you put in the fridge to enjoy perfectly fermented flavor next day. Always store your Kimchee in a airtight glass or metal container. 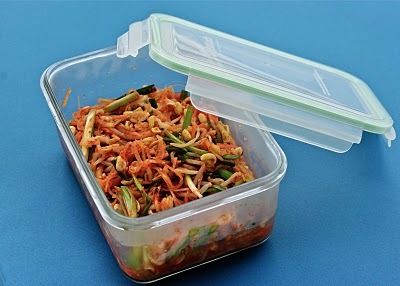 If you have to use plastic kind, let it be the designated container only for Kimchee. Plastic absorbs odor and you don’t want the smell mixed in other food. Also the fermentation process creates gas, which means smell! Keep a box or two of baking soda in your fridge when you store Kimchee. This will get rid of fridge Kimchee smell. Honestly I can eat a bowl of rice with just this Kimchee alone. But afraid of all the time and effort of making cabbage Kimchee? This will be the answer for you. Thinly slice the radish, thinner than 1/8", and then cut them into thin sticks. Place them in a bowl and add 2t salt and 2t sugar. Mix well, set aside for 30 minutes. They will get wilted and seasoned. Rinse and drain. Squeeze the radish to remove extra moisture. Set aside. 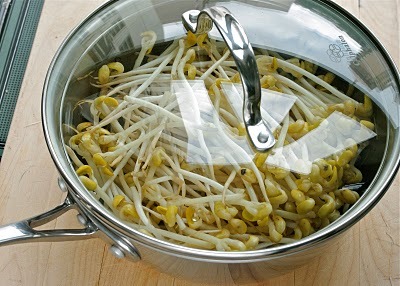 Meanwhile place bean sprouts in a pot with 1/4C water over medium heat. Cover with lid and cook until the steam comes out from the pan and reduce the heat to low. Cook 3-4 more minutes. Do not open the lid during cooking. 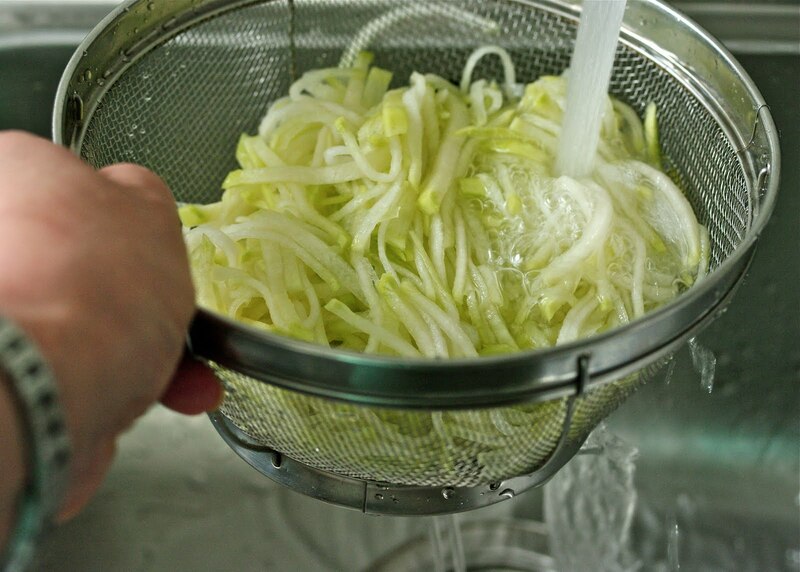 Drain the sprouts in a colander and let them cool. Place radish in a large mixing bowl and add 2T chili flakes, garlic, ginger, fish sauces. Mix well by gentle massaging motion. Return the bean sprouts to the bowl, add chives, carrots, rest of chili flakes(1T), plum axtract, sesame seeds. Mix again with same gentle massaging motion to mingle the flavor into the ingredients. Taste it to see if seasoned well. You can adjust amount of fish sauce as you like. Drizzle sesame oil and toss well. You can serve right away or keep in the room temperature for a half day(or whole day during winter time) to let it fermented, and then store in the fridge to serve next day. Serve chilled to enjoy the flavor. Note: Store your Kimchee in a airtight glass or metal container in the fridge. Nice step-by-step photos. Seems that the preparation is tedious - lots of slicing, cutting to do! Compared to real authentic Kimchee preparation, the slicing on this Kimchee is quite minimal, just 1/2 length of radish only. 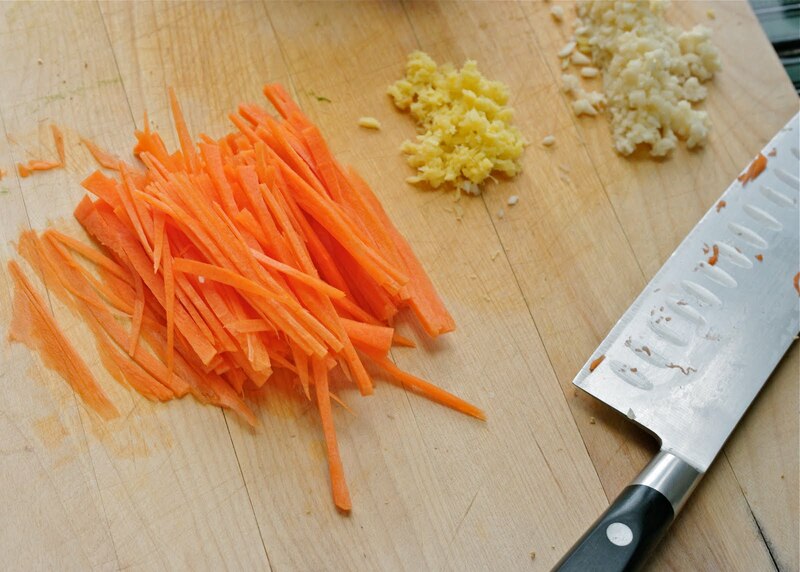 I like to slice veges! I just discovered your blog and I must say it is already one of my favorites. This particular recipe looks great and I love the pictures and instructions on your recipes. I'm very excited to have found this site!! Thanks TeKo. It is always nice to hear someone out there enjoy what I love. Hope you can try this recipe. Love bean sprout kimchee. Had it once at a korean friend's place. Thanks for sharing the recipe. This recipe sounds fantastic!!! 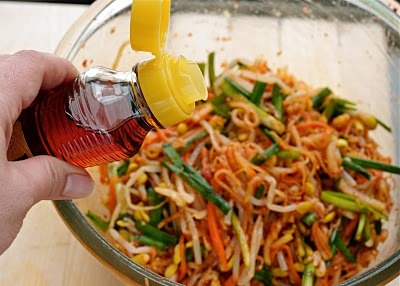 I cannot wait to make it and turn my brother on to the recipe...we love kimchee! Great! Hope you and your brother will like it. Not Kimchi, but Mu-chim. Looks delicious. Yes, it is Kimchee! Please, read my introduction part of this post which explains of this dish. You don't let Muchim dish go fermented. Muchims are far more quick to prepare and don't store longer than 3 days usually. They are meant to be quick side dishes. There are a lot more non-cabbage/radish kimchees than most people know. I love Korean food!!! some times I will make Korean for dinner learned from you tube, My son and I use to make Kim-chee together. This looks great and very easy, I will make it soon. Hi, Thank you for your blog -it is personal & informative. I just made the bean sprout kimchee & it turned out pretty good! I didn't have Korean anchovy sauce so I ended up using Thai fish sauce...next time I go to H mart in Vancouver - I will have to see if I can find it. Have a good Easter! Just found your blog from Copenhagen kitchen. I love your writing style!!! So funny, and so real. I have never made bean sprout kim chee and now I can't wait. It looks delicious. Will you one day, show us how to make that delicious crab stew/soup? I am half Korean and was born in or near Seoul and adopted at age 5 with my sister. The main thing I remember about Korea is the food, and I can't tell you how important that is to me! This looks awesome. I can't wait to try this recipe. Lisa, I am glad that you found my blog as well. It's funny because I, too, have been thinking about making a crab dish sometime soon. Crab is my favorite seafood! Yes, food is very important to me, too. The noodles is called Jjajangmyeon. One of my childhood favorite and my kids love it, too. I hope you would be able to find some good Korean ingredients soon in France. 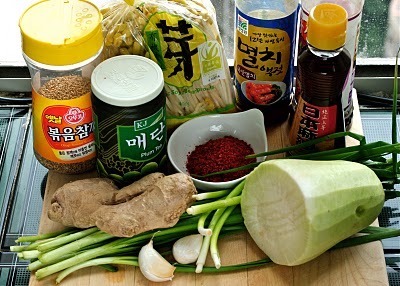 Thanks Holly, infact in my town, It's easy to find asian ingredients, but Korean once seem not popular here. Just some kinds of instand noodle.I still eat Korean foods by eyes! Looks great! How long can you keep this kimchi in the fridge? Does it get better as it ages? 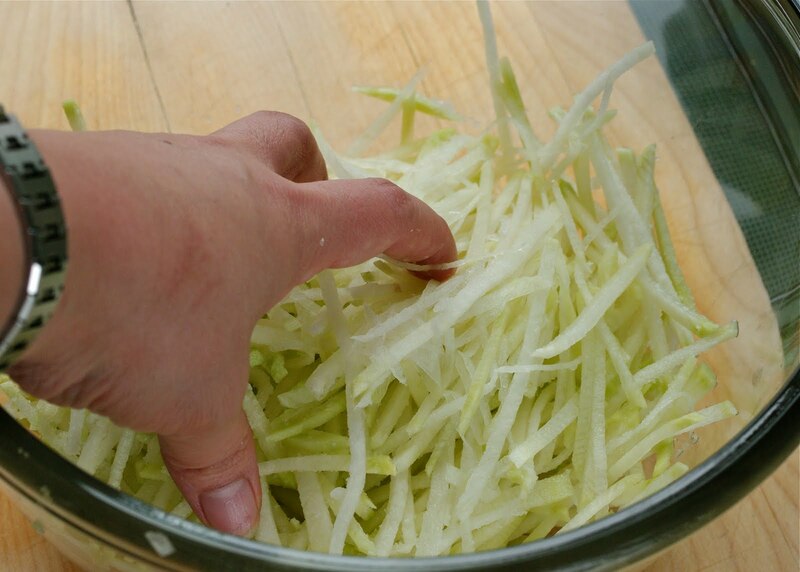 PS: I just made your cabbage kimchi recepie (3-part tutorial). It's fermenting at RT right now. Can't wait to try it in a couple of days. Great website and tutorials. Bean sprout kimchi can last in the fridge about 3 weeks, I would say. It will develope its unique fermented flavor as it ages. 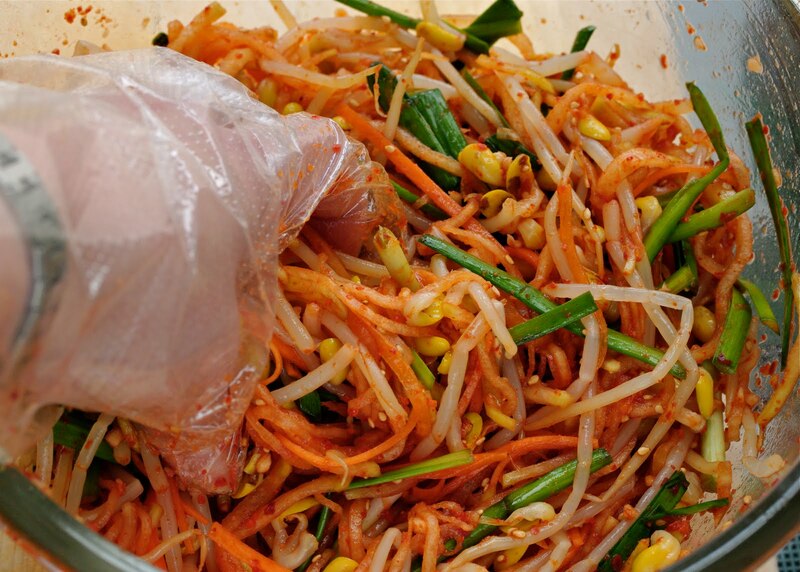 Unlike cabbage kimchi, you want to consume soon since the crunch texture might decrease. I hope your cabbage kimchi tastes good by now. Looks great , need to find Korean staple. Might be hard in my area . In some recipes I've seen reference to korean anchovy paste...do you know where I might be able to find this? does it make a difference between sauce vs paste? Hi Jason I've never heard the Korean anchovy paste. I know there is Italian anchovy paste, though. Anchovy sauce is widely available in any Korean store or even online site like amazon. Holly, is the plum extract in the recipe the same as those used for making the maesil drink? This sounds awesome! But what is the Korean name of the dish? 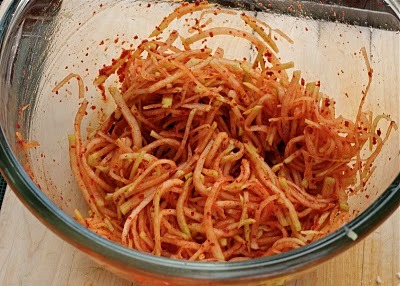 It is called 콩나물김치 (kongnamool kimchi). 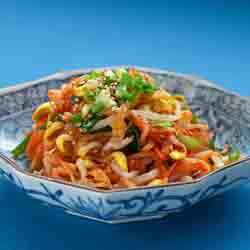 Hi Holly, I just discovered your blog and made your bean sprout kimchee, thank you for the recipe. You recommend to keep it in an airtight container. I have read that the build up of CO2 can blow up the lid and therefore there should be some air flow possible. Did that ever happen to you? Or can I safely put an airtight lid on it? It was sitting in the kitchen for 16 hours and I just moved it to the fridge. It never happened to me but I see the point. You have to make sure to leave some space on top inside of container for the kimchi to rise. During the fermentation, gas will release and you will need to have some space for the kimchi to expand. Use an air-tight container for better fermentation. Occasionally store bought kimchi jar might overflow with kimchi juice when you open the jar. That is because there was not enough space for the gas. And it will make big stinky mess! Hope your kimchi will taste great. Thanks.